What do you think of when you hear the word "propaganda"? Lies? Deceit? Politics? Dictionary.com defines it as, "information, ideas or rumors deliberately spread widely to help or harm a person, group, movement, institution, nation, etc." Wikipedia states that propaganda "often presents facts selectively (thus lying by omission) to encourage a particular synthesis, or gives loaded messages in order to produce an emotional rather than rational response to the information presented." I had to go to my trusted but ungainly Compact Edition of the Oxford English Dictionary ("compact" meaning that the five-pound tome is printed in such small type you have to read it with a magnifying glass) to get this unbiased definition: "any association, systematic scheme or concerted movement for the propagation of a particular doctrine or practice." "Propagation" is defined as the dissemination of an idea. In other words, propaganda is merely the spreading of an idea. Propaganda probably has a negative connotation because of the way it has been abused by despots and tyrants, the Nazi regime being an excellent example. But one must be careful not confuse the message with the medium. Is it a bad thing to have opinions? Is it a bad thing to state one's opinion clearly and forcefully? These questions and the nature of propaganda are explored in the current show at the First Street Gallery. The show was put together by Wayne Knight, a graphic design professor at HSU, and features custom-printed posters by over 30 alumni and advanced graphic design students. All of Knight's students are given this challenge in their intermediate class: to design a poster that convinces the viewer of something. It could be anything, and the issues in this show range from the political to the philosophical to the absurd. Knight tells his students, "It's easy to knock something, but that typically speaks to the audience that already agrees with you. How do you actually sway someone to the side that you want them to be on?" Propaganda can use some powerful elements -- strong visuals, clear and concise text, humor -- to convey a message. It can be extremely successful in the hands of someone who knows what they are doing. But the messages conveyed are merely the opinions of an individual or group and are no better or worse then those speaking it. Propaganda has been used as successfully by the government to make teenagers aware of the effects of drug use as it has by the tobacco industry to get them hooked on cigarettes (and yes, advertising most certainly falls under the definition of propaganda). The important thing for you, the consumer (and here I'm not referring to you as a consumer of products, but a consumer of culture) is to be aware of how you are being communicated to, and even how you can communicate back. When you're looking at the show, step back from the thing that the artist is trying to convince you of, and think about how they are doing the convincing. What is happening to you as the viewer? The visuals, of course, speak louder than words, and they draw you in and play on your emotions. In Propaganda 1, the artist Loren Meltzer captures your attention with a picture of what could be your grandmother, only she's looking at you very sternly. 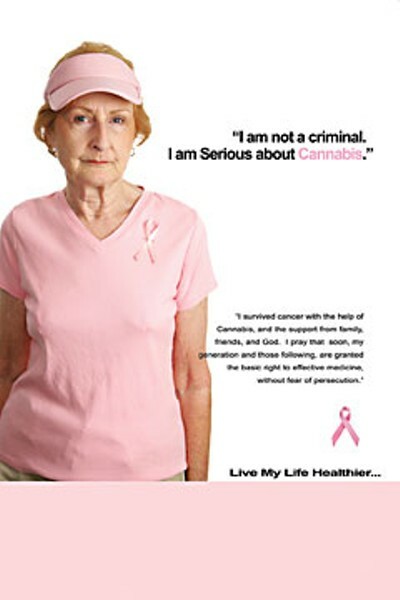 Color and the familiar pink ribbon are used to alert you to the fact that she's talking about breast cancer, and then the pink color is used again to draw you right to the word "cannabis." Now, marijuana and grandmothers don't go together. Do they? You have to read the text -- you just have to, because you need to know what brings these two unlikely things together. This piece took on Knight's challenge beautifully. It's hard to argue the artists position because there is no negativity to get your dander up. Your grandmother is telling you that cannabis saved her life. Is it biased? Of course. If you felt that pot saved your life, you'd be pretty strongly biased in favor of its use, too. You have every right to state your opinion as such, and if you don't like the poster you can design your own poster stating the opposing position. The issue need not be serious or global either. Aja Wells promotes her opinion of Arcata with the poster Poodles. 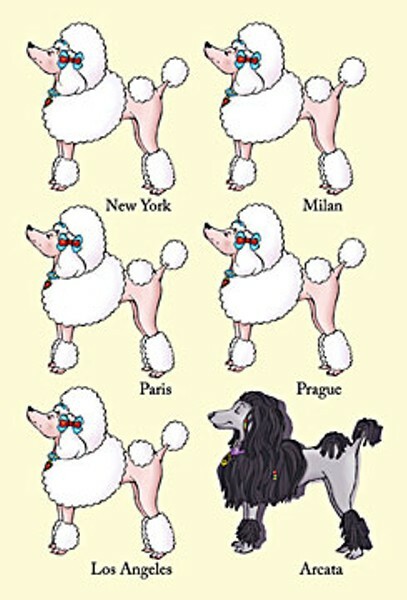 Six poodles represent five major cities and Arcata. The poodles for New York, Paris, Milan, Prague and Los Angeles all have the same chi-chi look -- they get their styles from Vogue magazine. The Arcata poodle is a true individual, with a superior smile and a look that shows pride in its uniqueness. There is no other text but the names of the cities; you can take the message as you interpret it. This is a fun show overall, and important too. Whether you realize it or not, you are surrounded by propaganda every day. It's not going to go away anytime soon, so you're best off to be well versed in the language. And since we're on the subject of convincing, I want you to take a look at this website before Election Day, Nov. 4. Artsvote 2008, at www.artsactionfund.org/artsvote, has a summary of the 2008 Presidential candidates positions on the arts. The propagandist in me wants to convince you that our next president, and all presidents, need to support the arts and arts education for children. This comparison should help you decide for yourself which candidate will be the strongest proponent of the arts. Propaganda will be on exhibit at HSU's First Street Gallery, 422 First St. in Eureka, through Nov. 2. Visit their website, humboldt.edu/~first, or call 826-3424 for more information.